It's important for you and your end users to be able to distinguish between legitimate alerts and the fake ones. The first thing to look for is if messages are displayed in your web browser. If so, you are probably dealing with a fake Microsoft warning. It’s possible that a reboot will close the pop-up, but it doesn’t mean the issue is resolved. If you get this notice or you're unsure if you’ve been infected, contact your IT Support team for assistance. 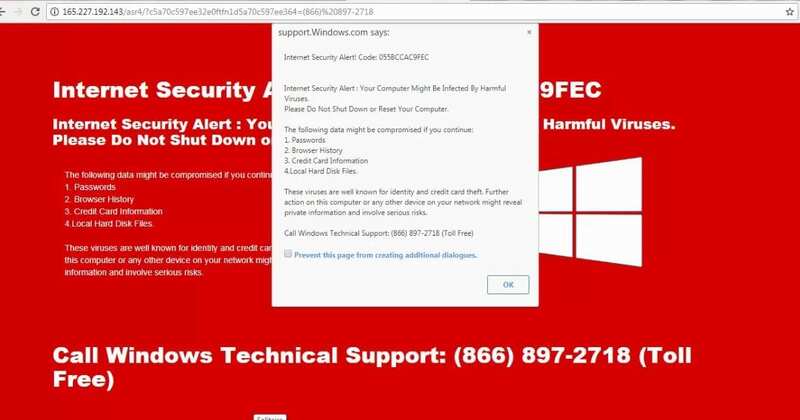 Microsoft Warning Alert is another fraudulent alert that roams the web aiming to trick users into believing that their machines are infected with some malicious spyware/riskware. You can’t close this pop-up like you would other internet windows, which tricks many users into thinking their computer has crashed or that a virus has been detected on their machine. This error message states that malicious content has been detected and therefore personal information – logins, passwords, banking details, etc. are at risk. The message creates urgency by indicating that the malware must be eliminated immediately and the only way to do so is by contacting 'certified technicians' via the telephone number provided. Note that the phone number provided is not toll-free at all – you will be charged to use it. If you fall for this scam, and you speak with the fake technicians, they may request to guide you through the removal process by gaining remote access onto your machine. After they get in, the scammer relies on confidence tricks typically involving utilities built into Windows and other software in order to gain the victim’s trust to pay for the supposed “support” services. But, once on your machine, the scammer actually looks to steal credit card account information AND potentially install a (RAT) Remote Access Trojan onto your system. Below are a few examples of what you may encounter. Beware that there are variants of this scam out there so you may have a different experience.